Why become an Honors Scholar? 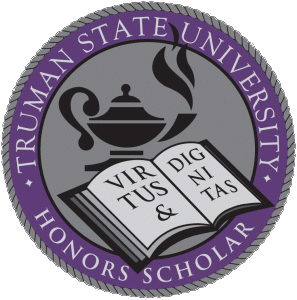 The Honors Scholar Program recognizes Truman students who wish to distinguish themselves beyond Truman’s already demanding standards by pursuing an even more rigorous and academically challenging path to fulfilling the Liberal Studies Program (LSP). ALL Truman students are eligible to participate. Honors Scholar courses come from outside a student’s own major and explore interesting and in-depth topics taken by majors in other fields of study. Taking LSP courses with students majoring in those disciplines raises the quality of discourse, the level of challenge, and the richness of the experience. Rich interaction and ongoing dialogue between professors and students, special attention to the development of advanced oral and written communication, as well as critical thinking, foster intense engagement with the material far beyond the mere transfer of information. Students should expect a level of personal, social, and intellectual development above what they encounter in other LSP classes. 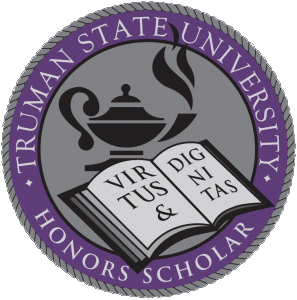 As an Honors Scholar, you receive recognition on your diploma and transcript and an Honors Scholar medal. Virtus stands for moral excellence and courage; it requires active expression of a sound intellectual basis. Rather than a one-time act of bravery, it stands for the product of the habit of disciplined, honest, and just living. Dignitas is the worthiness that a person earns and continually maintains. It is a public recognition of the qualities that set certain people apart from others and relates to an active life of civic service. One of the most immediate benefits came from working with a variety of really cool people (students and faculty) who I likely would not have encountered in my regular major courses. I also took comfort in knowing that even the Math majors were just as challenged by our GH Math course as I, the Linguistics major, was, and together we had a collaborative learning experience. As a Truman graduate, I’m now gainfully employed in a great job, and I have no doubt that my exposure and experience through GH helped me get where I am now. I also like that I can rattle off random information about ancient philosophers, mathematical proofs, famous artists, or different cultural traditions (thanks to my GH courses) at random. Have questions about the Honors Scholar Program?